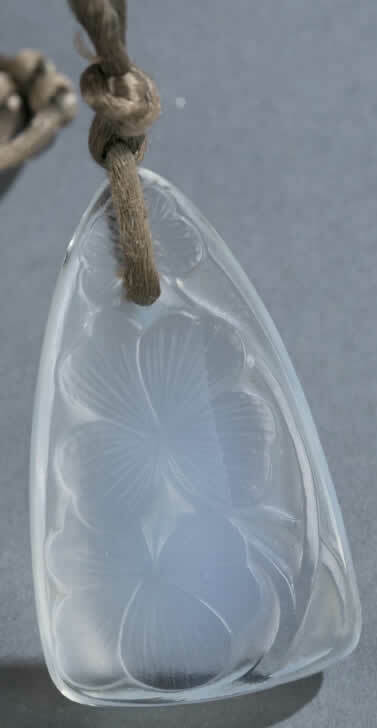 Rene Lalique Pendant Trefles: An apparent re-offer from November 11, 2017. Now Lot 128 Est: $200 - $400. An apparent re-offer from June 3, 2017. Now Lot 658 Est: $300 - $500. 2 and 3/8 inches tall by 1 and 1/2 inches wide soft triangular shaped clovers decorated opalescent glass hanging from a knotted green silk cord of unknown age. Lot 261 Est: $500 - $700.